All transactions are safe and secure with a reliable history in online purchasing behind each of our associates. Buy the Boardwalk Empire Logo t-shirt to own Boardwalk Empire clothing and merchandise. 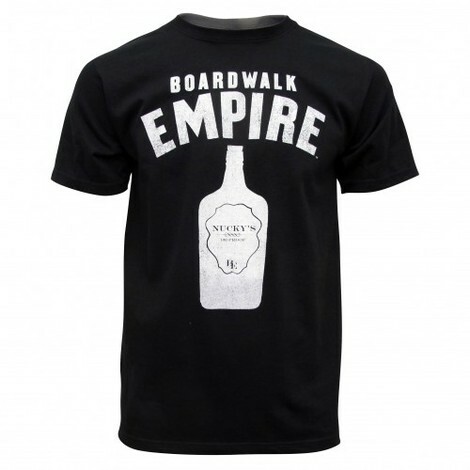 Our Boardwalk Empire clothing collection wouldn't be complete without this basic black Boardwalk Empire tee. It is perfect for any fan regardless of whether they enjoy the characters like young Al Capone, carnation clad Nucky Thompson, sly Lucky Luciano and determined Jimmy Darmody, or the spectacular set complete with Fralinger's Salt Water Taffy store, baby incubator viewing areas and Steel Pier theatres. Not only can you take this opportunity to treat yourself, you can also delight your best friend. Add a Boardwalk Empire poster or a Four Deuces shirt for a more specific gift that will please. In addition to the Boardwalk Empire Logo tee above, browse the Boardwalk Empire Clothing Gallery for more apparel like men's and women's clothes, kids shirts or hoodies.